Krunal snapped a wicket and maintained a miserly economy rate of 3.75 after bowling four overs at a stretch. 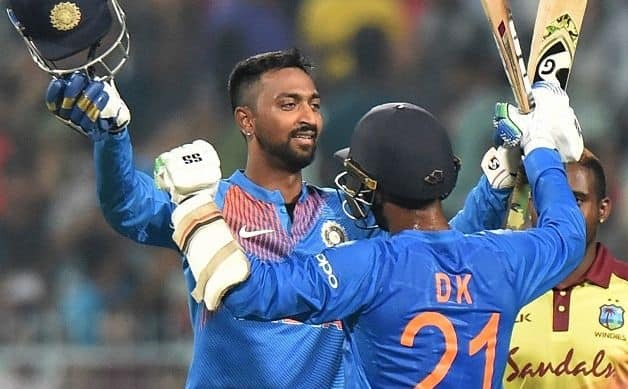 Krunal Pandya scripted a memorable debut hitting the winning runs in a tricky run chase that had quite a few hiccups along the way as India beat West Indies by five wickets to take a 1-0 lead in the three-match Twenty20 International series at the Eden Gardens in Kolkata on Sunday. 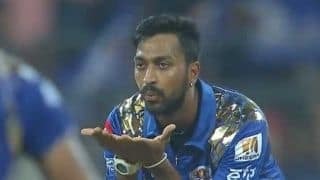 The elder of the Pandya brothers snapped a wicket and maintained a miserly economy rate of 3.75 after bowling four overs at a stretch. The win was India’s first over the reigning World T20 champions since 2014. Chasing a paltry target of 110 after Kuldeep Yadav’s 3/13 wrecked mayhem in the West Indies middle order, India made a meal of the run chase, losing openers Rohit Sharma and Shikhar Dhawan in the third over with just 16 on the board. Young pacer Oshane Thomas, among the three debutants – Fabian Allen and Khary Pierre were the other two – West Indies fielded on the day, proved his mettle, and wrote his name on both the top two Indian wickets with raw pace. Thomas, remembered for his fabled in-swinging peach of a delivery that shattered Shai Hope’s woodwork in the Caribbean Premier League this year, banged in a length ball that found the edge of Rohit’s bat. Denesh Ramdin took a smart catch behind saw the end of Rohit for just 6 in the last delivery of the first over. Dhawan was castled an over later with a 147kph ripper that straightened a bit after pitching on a length. The southpaw went for the drive, but missed it totally leaving his woodwork totally ruptured. KL Rahul consumed 16 deliveries for his 22 that included two boundaries, but couldn’t capitalise on his stay, after mistiming a pull shot off skipper Carlos Brathwaite that landed straight into the hands of Darren Bravo. Rishabh Pant failed to deliver and added just one to India’s run chase as the hosts were in a spot of bother at 45/4 in the eighth over. It took a sensible fifth-wicket partnership between Dinesh Karthik and Manish Pandey that yielded 38 runs for India to get back on track with the Caribbean boys breathing hard down their necks with tight bowling. Brathwaite in particular was exceptional in his bowling returning with figures of two for 11 in his four overs. Pandey (19) departed at a tricky time in India’s run chase after he jabbed at a delivery that hit him high on the bat leaving left-arm spinner Pierre spontaneously run to his left to dive for a brilliant one to complete the catch. Karthik and Krunal then shouldered the responsibility to take India home. The Tamil Nadu batsman Karthik showed fine resolve, dealing with ones and twos in his 34-ball 31 that had just three boundaries and a six to his credit. 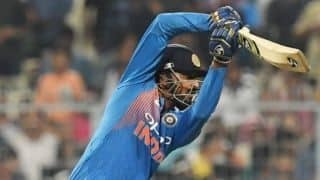 Krunal, meanwhile, justified the hard-hitting allrounder’s tag by clobbering three boundaries en route to his unbeaten nine-ball 21 as India romped home with 13 balls to spare. Earlier, after being put into bat, Kuldeep’s three for 13 ensured West Indies were restricted to 109/8. West Indies sprung a surprise introducing experienced campaigner Ramdin as Shai Hope’s opening partner. The plan failed miserably with Ramdin caught behind for just two off Umesh Yadav in the third over. The West Indies’ cookie crumbled with Ramdin’s departure. Hope (14), who was phenomenal in the ODI series, followed his team-mate back to the pavilion in the next after a bizarre run out that saw Hope and his Shimron Hetmyer running at the same end in a comincal run out in the fourth over. Hope had flicked a Khaleel Ahmed delivery towards midwicket and called for a run. Hetmyer, at the non-striker’s end responded hesistantly responded, before making a dash back at the non-striker’s end. Hope had his eyes on the ball and failed to see Hetmyer running back at the non-striker’s end and lack of communication saw both batsmen in a mess. From 22/2 in the fourth over, West Indies slipped to 49/5 in the 11th over. Hetmyer, who scored a century in the first ODI in Guwahati, failed to contribute after he was caught behind to give Jasprit Bumrah his first wicket. Krunal’s debut turned sweeter with his maiden T20I wicket of the experienced campaigner Kieron Pollard, who added just 14. Kuldeep then accounted for the next three West Indies wickets as the visitors slumped to 63/7 in the 15th over. The chinaman bowler also completed 100 wickets in T20 cricket. Allen’s 20-ball 27, which included four boundaries, and Keemo Paul’s nine bolstered the innings to 109/8 at a time when West Indies were looking to be folded inside the 100-run mark. Allen was dismissed after he tried to muscle one away, but his shot landed straight down the throat of Umesh at mid-wicket. The wicket gave Ahmed his first T20I scalp. After winning the Test series 2-0 and the one-day international series 3-1, India handed debuts to Krunal and left-arm pacer Ahmed.